The Kona has a sleek, sharp shape. Its front end has Hyundai's cascading grille and LED twin headlights. 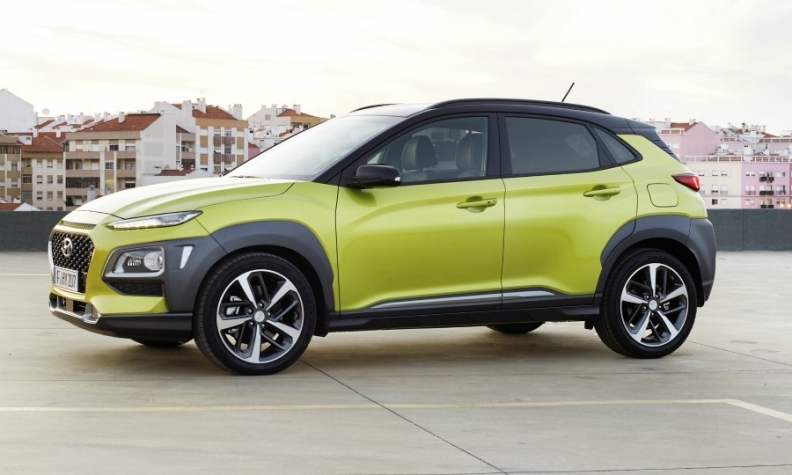 Hyundai hopes a sharp design, advanced connectivity features and off-road capability will help win Canadian customers for its Kona subcompact SUV. The vehicle is scheduled to arrive in showrooms in late winter or earlier spring, Hyundai Canada spokesman Chad Heard said. Pricing hasn’t yet been announced. “The Kona will absolutely offer AWD in Canada; most vehicles will be so-equipped,” Heard said in an email to Automotive News Canada. This option is designed to broaden the Kona's appeal beyond those who use the car just for city driving and brings the Kona in line with Hyundai's larger SUVs, the Tucson and Sante Fe, which have AWD versions. With the Kona, Hyundai hopes to attract younger customers who place importance on connectivity with features such as wireless charging and an eight-inch display. The Kona's muscular design with bold lines, LED lighting and fender cladding are also in line with younger tastes, as are the two-tone body colour combinations, which are increasingly popular with buyers of small SUVs. To attract customers downsizing from compact cars, Hyundai is also offering safety equipment such as pre-collision braking, lane-keep assist and blind-spot monitoring.. Besides young people, potential Kona customers include so-called "empty-nesters" -- older people who don't need a big car anymore because their children have left home. The Kona will offer two four-cylinder powertrains, both of which are used throughout Hyundai and Kia's lineup. The base Kona gets a 2.0-litre engine that makes 147 hp and 196 pounds-feet of torque. It's paired with a six-speed automatic transmission and will go from zero to 10 km/h in about 10 seconds. A 1.6-litre turbocharged four-cylinder engine will be optional. It will make 175 hp and 132 pounds-feet of torque, enough to go zero to 100 km/h in about eight seconds. It's matched to a seven-speed dual-clutch transmission. A diesel version will not be offered as it is Europe. With the subcompact SUV segment booming, the Kona enters a an already crowded field. It will join the fray just as Nissan debuts the Kicks small crossover. Technology: A head-up display that projects information into the driver’s line of sight. Connectivity: The Display Audio allows passengers to switch smartphone content on to the system’s display via Apple CarPlay and Android Auto. Powertrains: A 2.0-litre four-cylinder engine and an optional 1.6-litre turbocharged four-cylinder engine. Andrea Malan of Automotive News Europe and Greg Layson of Automotive News Canada contributed to this report.